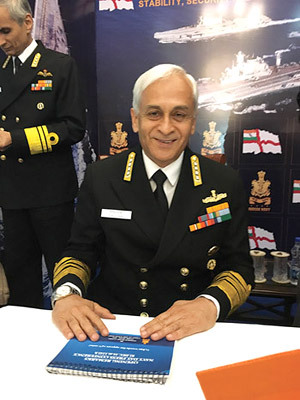 Chief of the Naval Staff Admiral Sunil Lanba in an exclusive interaction with SP’s M.A.I. said that “2016 witnessed the induction of a number of state-of-the-art platforms”. SP’s M.A.I. (SP’s): Over the past one year, how would you like to rate the progress of maritime capability build-up of the surface combatants of the Indian Navy, including the aircraft carriers, as also the projects under construction/development? Chief of the Naval Staff (CNS): The year 2016 witnessed the induction of a number of state-of-the-art platforms such as the guided missile destroyer, INS Chennai and anti-submarine warfare corvette, INS Kadmatt, along with other platforms like the water jet fast attack craft, INS Tihayu and fast interceptor craft for coastal security, among many others. Further, the first of the eight landing craft utility (LCU) Mk IV ships, L-51 has been delivered. In addition, the second ship of the P-15B class guided missile destroyers Mormugao was also launched this year. Delivery of MiG-29K, P-8I and Hawk trainer aircraft, contract conclusion for four P-8I aircraft and midlife upgrade of Kamov 28, would provide a fillip to the Indian Navy’s Aviation Arm. The first Project 75 submarine Kalvari is undergoing extensive trials and her induction would be another major milestone for our shipbuilding programme. So as you see our projects are all moving along at a good pace as per the blueprint laid down in our Maritime Capability Perspective Plan. SP’s: As per available reports, the command of the Tri-Service Andaman and Nicobar Command will now permanently rest with a naval Commander-in-Chief. What are the plans to augment security apparatus, infrastructure and facilities and maritime force levels of the Command? CNS: The Andaman and Nicobar Command (ANC) have matured as a Tri-Services Command and are built on the edifice of jointmanship. Effective synergy is being maintained between the three Services and plans are afoot to further strengthen the Command with appropriate maritime assets and also augmentation of infrastructure to increase overall security. Measures initiated include positioning of an all-weather missile armed, helicopter capable ship at ANC. The first ship of the LCU project under construction at the Garden Reach Shipbuilders and Engineers Limited will be commissioned shortly and seven more of these will follow. In addition, plans are also underway to augment the force level of ships, aircraft, helicopters and unmanned aerial vehicles at ANC. Infrastructure projects including construction of additional jetties, technical support facilities and construction of an additional floating dry dock are being progressed. Operational Turn Round (OTR) bases at Diglipur, Campbell Bay and Kamorta are also being progressed to have adequate facilities for ships to operate from the islands. Similarly, the runways at Shibpur and INS Baazat Campbell Bay are being extended to facilitate operation of all aircraft in our inventory. SP’s: Maritime capability build-up in the segment of sub-surface fleet has sourly lagged behind, including the complications relating to procurement of torpedoes for the ongoing Scorpene project and inordinate delays in the acquisition process for the conventional submarines under Project 75(I). What are the measures conceived to bridge the capability gaps? CNS: wAccordingly, as envisaged in the 30-year submarine building plan, construction of six P-75 submarines at the Mazagon Dock Limited (MDL) in Mumbai is in progress. Whilst there have been delays due to unforeseen developments, we have taken mitigating steps to ensure that our desired capability is not compromised. The P-75(I) project is being actively pursued. We are hopeful of an early finalisation of Strategic Partnership Model which would enable us to progress the case. You would also be aware of the Medium Refitcum-Life Certification programme for our submarines which has been approved by the government. This has been specifically done to bridge the gap and ensure that our technical and tactical edge is retained. As regards heavyweight torpedoes (HWT), the Navy is awaiting promulgation of the finalised guidelines on debarment by the Ministry of Defence (MoD) for progressing procurement. SP’s: There are reports to suggest that the Defence Acquisition Council has approved indigenous development of additional SSBN and SSN platforms. Would you like to offer comments on the approved plans? CNS: Construction/acquisition of nuclear powered ballistic attack submarines (SSBNs) is under the purview of Nuclear Command Authority and no specific data is available for the same. As regards nuclear powered attack submarines (SSNs), the Cabinet Committee on Security approved the construction of six SSNs in January2015 and the same would be constructed as per planned schedules. SP’s: What is the progress made by the Joint Working Group on Aircraft Carrier Technology Cooperation as a subset of the larger Indo-US Defence Technology and Trade Initiative (DTTI)? CNS: As the readers would be aware that the Joint Working Group on Aircraft Carrier Technology Cooperation (JWGACTC) was formed in February 2015 under the Indo-US DTTI framework. The Joint Working Group (JWG) has emerged as an effective tool for exchange of information in the niche field of aircraft carrier technology. The information shared under its auspices has potential to benefit the Indian Navy in the indigenous aircraft carrier programme. The forum has enabled the Indian Navy to exchange views on Aircraft Launch and Recovery Equipment such as catapult, Electromagnetic Aircraft Launch System (EMALS) and Aircraft Arresting Gear (AAG). The discussions on aircraft carrier acceptance trials are particularly beneficial considering that the Indian Navy would be undertaking trials of IAC-1 in 2017-18, the signing of Information Exchange Annex (IEA) in June this year promises to be a powerful enabling tool towards sharing of information in the field of aircraft carrier technology. SP’s: There are critical voids in the naval aviation assets, especially the naval multi-role helicopters, naval utility helicopters, fixed-wing airborne early warning, amphibious aircraft, naval ship-borne unmanned systems, etc. Would you like to describe the measures initiated to fill the void in a reasonable time frame? CNS: The Indian Navy continues to progress several procurement cases related to aviation assets. We are presently progressing cases for Dorniers, ALH, Chetaks and MRH helicopters. All these projects are at advanced stages in the acquisition process which are likely to be concluded shortly. You would be aware of the decision to procure four additional P-8Is and conclusion of contract for midlife upgrade of Kamov 28 helicopters. Whilst there have been some delays, as you can see steps have already been taken to ensure that voids are addressed expeditiously. 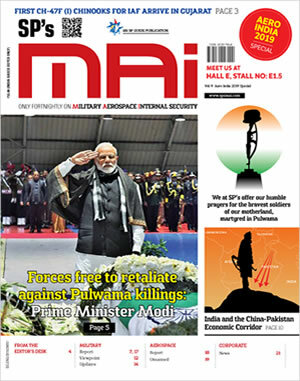 SP’s: Consequent upon increasing complexity in the maritime security environment in the Indian Ocean region and the Indo-Pacific, how well is Indian Navy prepared to face the dynamic challenges? CNS: The Indian Navy has been at the forefront of national efforts to strengthen relations, enhance cooperation and promote maritime security in our areas of interest. Our force level accretions have enabled us to ensure that we remain fully capable of securing our maritime interests and also be the net maritime security provider in the region. To maintain stability in the complex security environment of the Indian Ocean region and Indo-Pacific, Indian Navy is engaging maritime agencies in the region to shape a favourable and positive maritime environment. The Indian Navy is also pursuing a range of measures for engaging maritime forces from friendly countries, so as to enhance cooperation and also develop interoperability. These include exercises, training and technical cooperation, developing of shared maritime domain awareness, sharing of white shipping information, capacity building and capability enhancement measures, and various cooperative maritime security operations, with sustained interactions at field, operational and maritime strategic levels. SP’s: In a historic verdict by the UN Permanent Court of Arbitration dismissing the claims of China within the ‘Nine-dash Line’ of the South China Sea. Predictably China in a most belligerent fashion has dismissed the verdict outright, causing severe consternation among the maritime nations who look for the right of innocent passage to promote own trade, commerce and exploratory rights within the region. Considering the emerging maritime security environment, what would be the role of Indian Navy in this region? CNS: India supports freedom of navigation and over flight, and unimpeded commerce, based on the principles of international law, as reflected in the United Nations Convention on the Law of the Sea (UNCLOS). 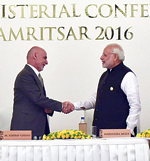 India believes that states should resolve disputes through peaceful means without threat or use of force and exercise self-restraint in the conduct of activities that could complicate or escalate disputes affecting peace and stability. It is reiterated that Sea Lines of Communication passing through the South China Sea are critical for peace, stability, prosperity and development of the region. As a state party to the UNCLOS, India urges all parties to show utmost respect for the UNCLOS, which establishes the international legal order of the seas and oceans.